Green Bay Packers – Official Blog | News now! Eddie Lacy improving, but will he play? News now! Eddie Lacy improving, but will he play? GREEN BAY — Eddie Lacy’s ankle injury is improving, but will it improve enough in time to play against the Kansas City Chiefs on Monday night? 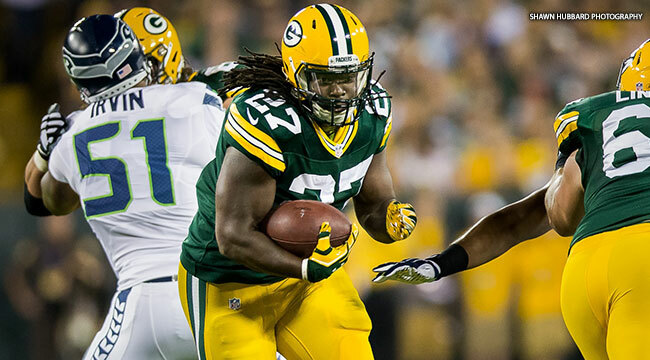 Adams also sustained an ankle injury in the win over Seattle, but Adams returned to action, Lacy did not. Monday’s game will feature a clash of quarterbacks from the same draft class, 2005. Alex Smith was the first pick of that draft, by San Francisco, where McCarthy was Smith’s offensive coordinator. Aaron Rodgers was the 24th pick of that draft. “Alex Smith, very bright young man. He’s grown a lot since then. He looks very comfortable in the system in Kansas City. He understands what defenses are trying to do to you. He’s more athletic than people give him credit for,” McCarthy said. Click here for Packers.com’s locker room report.